You can read a full recap of Barber’s month for January in our monthly prospect report right here. Barber, 24, collected 14 points (seven goals, seven assists) in 10 games for the Chocolate and White in January. The winger had five multi-point games in the month, and added a pair of game-winning goals, as well as two markers on the power play. He contributed to the scoresheet in eight of Hershey’s 10 games over the month, and played a large role in the club’s current seven game point streak (6-0-0-1). Barber began the month by scoring a pair of goals and adding an assist in the Bears’ 6-4 win over Grand Rapids on Jan. 5. He scored two more goals in a 3-0 win at Lehigh Valley on Jan. 12, and extended his scoring streak to five games by recording two assists in a 5-4 win over the Phantoms the next night. Barber tallied a goal and an assist to help Hershey to a 5-3 win at Wilkes-Barre/Scranton on Jan. 19 and duplicated that effort in a 4-1 victory at Bridgeport on Jan. 21. Barber closed out the month with a goal in the Bears’ 4-2 win over Laval on Jan. 26. The Pittsburgh native is tied for the team lead with 38 points this season (18 goals, 20 assists), as well as power play goals (nine). He is tied for the AHL lead in power play points with 22.The alternate captain has played 211 career games with Hershey, scoring 158 points (77 goals, 81 assists). Barber was a sixth round selection of the Washington Capitals in the 2012 NHL Draft and appeared in three games with the Capitals in 2016-17. He was previously named the CCM/AHL Rookie of the Month in February 2016. He will be presented with an etched crystal award prior to an upcoming home game in recognition of his achievement. 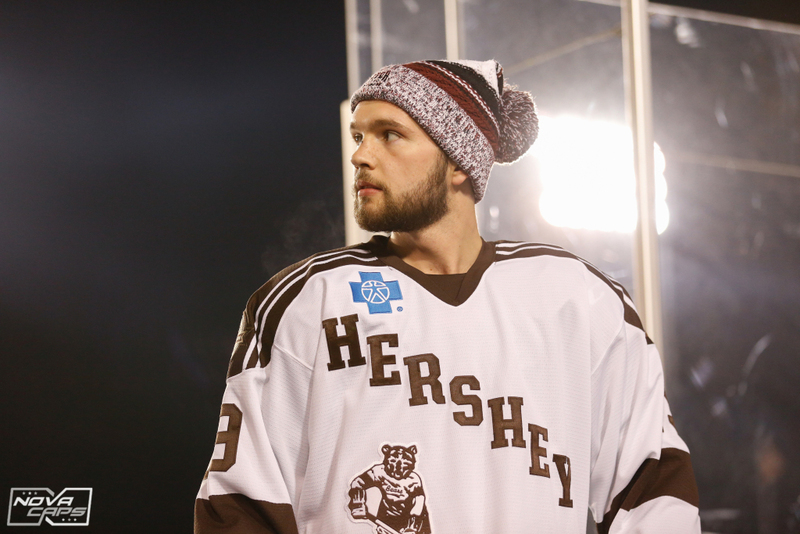 Barber and the Bears return to the ice tomorrow night at 7 p.m. versus Lehigh Valley. It’s AAA License Plate Frame Night for the first 5,000 fans. Ticket information is available at HersheyBears.com. This entry was posted in News and tagged CCM/AHL Player of the Month, Hershey Bears, Riley Barber. Bookmark the permalink.